Frankie was such a scared, skittish boy and such a challenge when we first started fostering him that we almost gave up on him. Thankfully, GALT volunteers were extremely helpful and patient. 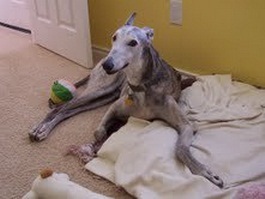 They gave us so much support and encouragement that we continued to foster Frankie and eventually adopted him. We had to be very patient with Frankie as he learned to trust us. I often think of how far Frankie has come since I met him. We are so glad we gave him a chance. He is the love of my life and I have such an extremely strong bond with him. I spoil him so much that my husband jokingly says he is jealous of Frankie. Frankie is 12 years old now. He is quite grey, but so handsome!! He loves our daily walks and always walks by my side. 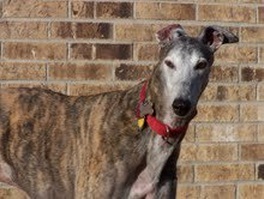 He still runs around the yard and plays with our youngest greyhound Adam, but not as long and hard as in the past. Frankie has been protective of me for awhile, but as he has aged, he has taught Adam and now lets him be the protector. I am so thankful to have Frankie in my life.